Within a short month, two media frenzies "gripped" the world. The first was the Trump-Kim Summit, and the second, the recent rescue of the 12 boys and their coach from the Tham Luang cave in Thailand. Both evoked different reactions, emotions, have two very different endings and hopefully, provide some lessons for us to ponder and reflect on how we should face the daily onslaught of news that come our way and prepare ourselves for the "brave new world". One story is of a megalomaniac and dictator threatening fire and fury on humanity and then putting on a song and dance of averting a "war" that is entirely in their own making. The pageantry was tolerated and the expectation going into the summit was low. The ending was lauded but the eventual outcome may prove more dubious. The other story is one that warms the heart. The whole rescue of the 12 boys and their coach from a flooded cave was described as a "triumph of bravery, expertise and love" and "a model of international cooperation and coordinated selflessness" by The Guardian. Emotions, thoughts and prayers going into the whole operations were real, the planning meticulous and the outcome couldn't be better reflected than by one mother's instructions to her son "After you come out of the cave, you have to say thank you to every single officer". Perhaps one can be accused of trying too hard to compare and contrast these two seemingly irrelevant headline-grabbing media stories. Yet it is in pondering these two stories that one can reflect on how we view the world and the role that media can play in shaping our worldview. Of late, we have been inundated by news that easily make us wonder where the world is heading, and if we are moving backwards to a Hobbesian world where life is nasty, brutish and short. The gun violence in America, the plight of refugees and migrants everywhere, the protracted war in the Middle East, extreme climatic events, trade tensions, etcetera. The constant reports in the media of Trump's insults, tweets and lies also make one wonder about common decency and decorum. Do we really have to shout and insult and resort to threats in order to be heard? Should the media reward selfish, voyeuristic and bombastic behaviour by giving it more attention than needed? In contrast, look at how the story of the boys trapped and then rescued from the Tham Luang cave unfolded. 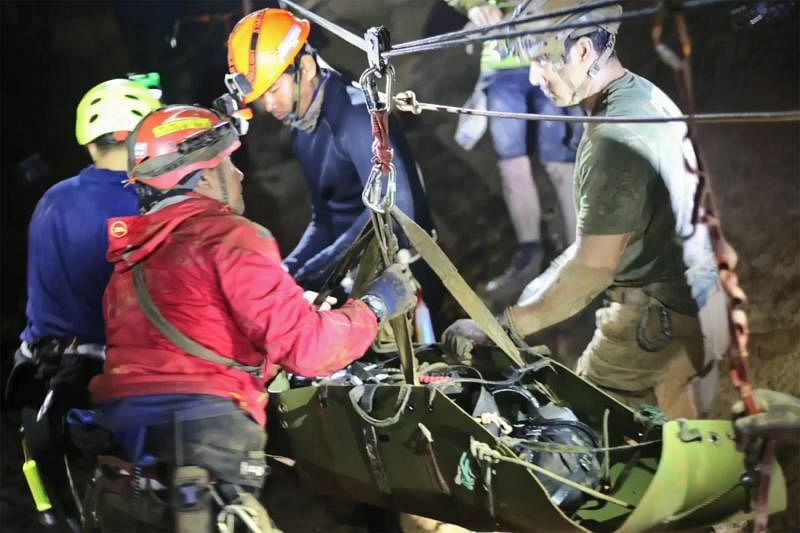 The focus was on the challenges and the efforts needed to stage the rescue, on how people come together from all over the world to offer their expertise and assistance, and on the team efforts that resulted in the successful rescue of all the boys and their coach from the Tham Luang cave. The story not only served as a reminder that people matter, but also gave us hope that when we work together, united in our purpose, "miracles" can happen. There is no single hero in this effort, only many heroes - sung and unsung - and helping hands. While Trump was fast to take credit for supposedly bringing the world back from the brink of nuclear Armageddon, no one in the rescue story came forth to brag about their bravery. The tragic death of a former navy seal Saman Gunan in the rescue operations gently reminded us of the sacrifices and bravery of everyone in the team. One might also be a little idealistic and venture to hope that the Tham Luang cave rescue story would make us more aware of how the world is not only about egoistic politicians, ruthless dictators and self-interested nation states. We are first and foremost, fellow human beings, and whatever our differences, the sanctity of human lives and a common decency should bind us. Populist and divisive politicians may want to think only in terms of "us versus them", yet we know the world is far more inter-connected and nuanced all at once. There will always be differences amongst us, but we can seek common goals and work on them together - whether to alleviate poverty, address environmental challenges, save biodiversity, or speak up against violence and injustice. Each and every one of us can contribute in our own way to make a difference for the better. In fact, as the Tham Luang story shows, international cooperation need not only be between state and state, but can be nurtured through informal networks of volunteers. With the speed and ease of communication, people from all over the world can come together and work together towards a common goal. Increasingly, both states and non-state actors, individuals with expertise and skills need to work in tandem if we are to be able to address the many different challenges that face humanity. Dr Yeo Lay Hwee is a Senior Research Fellow at the Singapore Institute of International Affairs.